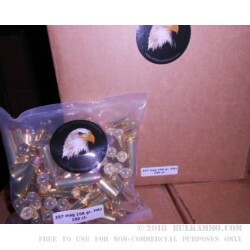 A 1000 round case lot of the remanufactured ammunition by MBI (Military Ballistics Industries) which has carved out quite a name for themselves and is among the top end for remanufactured ammunition anywhere in the USA. This is a .357 Magnum 158 grain FMJ load that offers compelling performance and value once you look at the component parts and the process by which the ammunition is remade into something premium for the shooters who want quality but don’t want to pay too much for it. The MBI model is to use once fired brass; along with high end components that other new manufactured rounds would be jealous of in some cases. Components like Hodgdon powders; CCI primers and Winchester brass. These are a game changer at this price point because of the reliability they offer. As a result, MBI has enjoyed one of the best reputations for remanufactured ammunition in the USA, which is a hard industry to retain a consistently good reputation in. The business of the remanufacturing of ammunition is not an easy segment; and the ammunition is not perfect, admittedly, but through excellent partnerships (like BulkAmmo), MBI has maintained very good customer support.